France is planning an architectural competition to design a replacement spire for Notre-Dame Cathedral in Paris, after the old one collapsed during the fire. French prime minister Edouard Philippe announced the news to journalists, reported the BBC. He said that, instead of simply recreating the original spire, they want a new design “adapted to the techniques and the challenges of our era”. He said they will be putting out an international call. “As is often the case in the evolution of heritage, we should endow Notre-Dame with a new spire,” he told reporters. 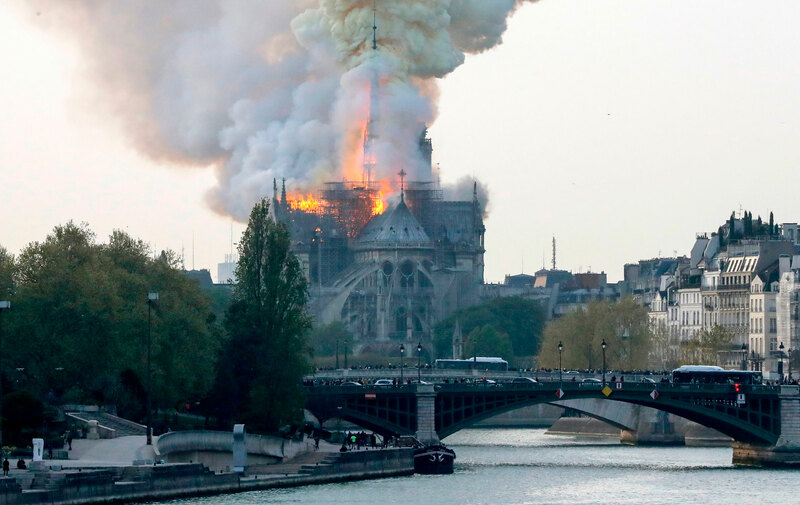 The spire dramatically collapsed in front of crowds, who had gathered to watch in horror as the historic French gothic cathedral went up in flames. Images of the moment it toppled into the flames were splashed across social media and newspaper front pages. However this spire was not an original part of the cathedral, which was built in the 12 and 13th centuries. The first spire is believed to have been part of the roof between the 13th and 18th centuries, but was removed due to wind damage. French architect Eugène Viollet-le-Duc added a new spire over the transept as part of his restoration in the 19th century. Made from oak covered with lead, the spire was 90 metres tall and weighed 750 tonnes. It was decorated with 12 copper statues and topped by a copper rooster holding three relics. The 16 figures were not destroyed when the spire fell, as they had been airlifted for restoration just days before the fire. A slightly flattened cockerel has been recovered from the wreckage. President Emmanuel Macron has promised Notre-Dame Cathedral, which suffered a huge fire on 14 April, will be rebuilt to be “more beautiful than ever”. He also said the restoration would be done in five years, although experts estimate it would be closer to decades before the cathedral is restored to its former glory. Over €800 million (£694 million) has already been donated by various billionaires and corporations to help rebuild Notre-Dame. Firefighters have been using drones to survey the cathedral, reported the BBC, and are making assessments of the damage. Investigators are interviewing workers to find out if restoration works that were being carried out at the time of the fire could have been the cause of the blaze. Main image is by Clem/Wikimedia Commons. The post France to launch competition to design a new spire for Notre-Dame appeared first on Dezeen.